This dip is fantastic. If you’re having a get together for Labor Day, you should definitely make this. Everyone will thank you. My dear friend, Becky, made this a while back for a baked potato bar dinner party, and it was super scrumptious! I’ve been dreaming about it ever since. So since we were cooking for vegetarians and gluten-free eaters at the beach, I thought a baked potato bar with this dip would be the perfect thing. It was a huge hit and the leftovers of this dip make an excellent snack with tortilla chips, or would be great mixed with scrambled eggs, or would be delicious eaten with a spoon! …I think I need to make this again ASAP. For convenience sake I left out the rice when I made it at the beach. Next time I’ll add it in. It’s not very noticeable, but acts as a great binder for all the delicious beans and cheese. Preheat oven to 400°F. Grease a 9×13″ pan or deep casserole dish with cooking spray. 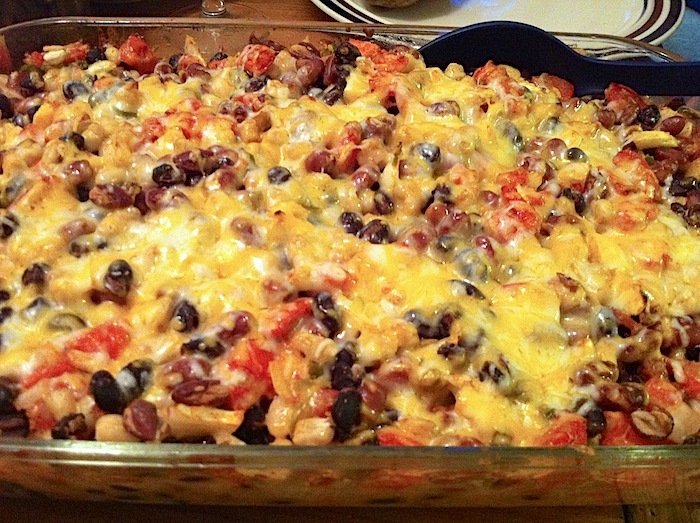 In a large bowl, mix beans, rice, tomatoes, onion, jalapeño, spices and 4 cups of cheese together. Season generously with salt and pepper. Spread mixture into prepared baking dish. Cover with foil and back for 30 minutes, until bubbly. Remove foil and add remaining cheese. Bake for an additional 10-15 minutes, until cheese is melted. Serve with baked potatoes, chips, eggs, crackers, or spoons! Thanks, Grammy! I think it’s great for company, really easy to throw together. I also had a brilliant idea to use this to stuff bell peppers, so that’s another idea too. Aaah I want to eat it RIGHT NOW. Thanks for the link, lovely!